For those of you who have asked me - "please tell me when something REALLY special comes in" - consider this your wake up call! Offered is this incredible Carve Top by Stephen Marchione. Few electric guitars are more special than this incredible piece. For those who aren't familiar with Stephen's work, he apprenticed with Pensa Suhr and has worked with John Suhr and Mas Hino. He builds both acoustic and electric guitars in extremely small quantities (just 400 or so to date). 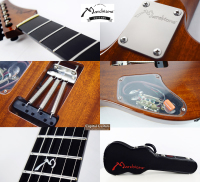 He is known as a fabulous luthier and has built guitars for artists such as Mark Knopfler. As you would expect, this guitar has a solid body with a carved, arch top. 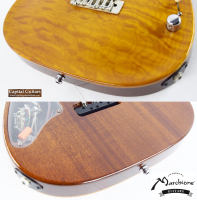 In this case the body is made from a very special batch of 50 year old Honduran Mahogany. 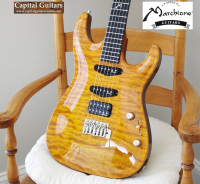 The incredible top is made from a single piece of highly quilted Maple of a quality that Stephen indicated is among the best he has ever seen. 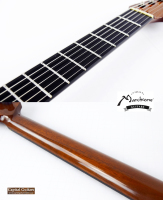 The neck is also made of the same Honduran Mahogany and has a marvelous medium/large C shape with depth measurements of .88" at the first fret and .95" at the twelfth fret. The fretboard is made of Black Ebony and has a compound radius of 12"-14". 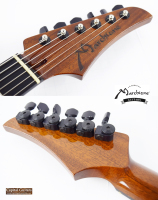 The frets are Stainless Steel medium jumbos and the bone nut measures 1-11/15". Stephen favors a Wilkinson trem bridge and Sperzel locking tuners. 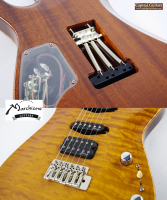 The electronics include Marchione-branded DiMarzio pickups, Evidence Audio wiring and a standard Stratocaster control layout. This guitar weighs nearly 8.5 pounds, undoubtedly due to the extremely dense Honduran Mahogany, but the tone you get is well worth the price. I've played quite a few guitars and there are few which compare with the workmanship, feel and playability of a Marchione guitar. 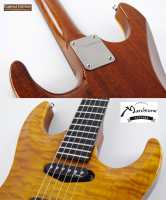 Early Pensa Suhr guitars are probably the closest for comparison purposes. This guitar feels like it was sculpted from a single piece of material. It is a gorgeous piece of luthier artwork, while also being almost surgically smooth in it's ability to empower you to play. It's one of those rare guitars that seemingly makes you a better player! The tone is of a caliber you don't get from many other electrics. Please check out the brief sound sample provided. While my sample certainly doesn't do this amazing guitar justice, I think you can hear the depth and richness of this guitar's voice. Built in 2013, this guitar has had two prior owners, both from Texas where Stephen's shop is located. It has been played but respected for the treasure that it is. The top, neck, fretboard, frets and headstock are in excellent plus condition, but the back of the guitar shows it's share of buckle worming (see photo). If not for the buckle wear, I would likely be classifying it's condition as near mint. 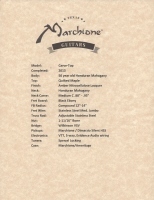 It comes in a Marchione branded Ameritage humidifier case along with the trem arm. Stephen builds very few guitars and his instruments are seldom available on the used market. A new example of this guitar would cost you at least $8,500 and a significant wait and even then you couldn't get tone woods of this quality no matter how much you paid. Get this previously loved 2013 beauty for quite a bit less.